Add a little pop to your plate with the crunchy texture and nutty, earthy flavor of puffed quinoa. Exposing the tiny grains to a short burst of heat, either in the oven or on the stovetop, results in an airy bite. 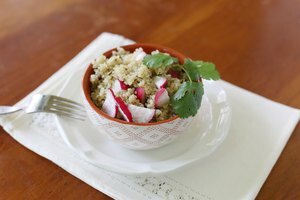 Thanks to the hype surrounding quinoa's status as a superfood, you won't have any trouble getting your hands on this nutritious, versatile pseudo-grain; and after a little preparation, you can have your own homemade puffed quinoa ready to use as a snack, cereal or substitute for other puffed grains in your favorite recipes. 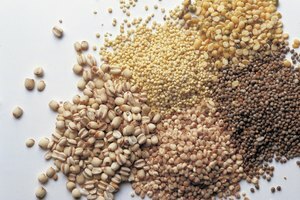 Quinoa naturally contains high levels of bitter tasting saponin. Although rinsing quinoa isn't strictly required, it produces a milder flavor -- which is particularly important if you have a sensitive palate. 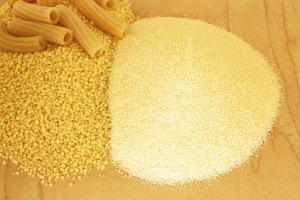 To rinse quinoa, place it in a fine-mesh sieve and rinse it under cold water for approximately 2 minutes. Another helpful, although not required, step simmers the quinoa briefly to add moisture to the grains. 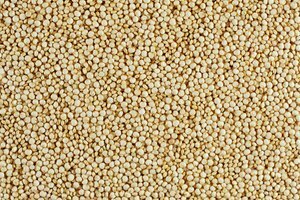 The process to make commercially prepared puffed quinoa --called gun-puffing -- typically involves heating it in a special pressurized vessel with a little bit of water, which causes the grains to expand. To achieve a similar result, simmer 1 part quinoa in 1 1/4 parts water for approximately 15 to 20 minutes. Drain the quinoa and spread it in a single layer on a baking sheet. Let it air dry overnight or for about one hour in an oven that's been heated to 100 degrees Fahrenheit. The most effective method for puffing quinoa -- and most other grains -- involves a quick burst of high heat. You can achieve this by cooking the quinoa in a very hot oven. 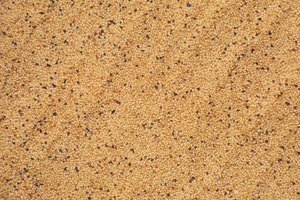 Start by heating the oven to 500 F. Place the prepared quinoa on a baking sheet and cook it for approximately 2 to 3 minutes or until it pops. Not unlike making popcorn, creating quinoa puffs -- or popped quinoa -- on the stovetop requires a tall-sided pot and a lid to help prevent the quinoa from shooting across the room as it puffs. Start by preheating your pan over medium-high heat. Once it's hot enough that a drop of water sizzles, begin making the puffed quinoa, working in small batches of roughly 2 tablespoons of quinoa at a time. Place the quinoa in the hot pan and cover it. The grains should start popping nearly immediately, and typically finish within 10 to 20 seconds. Once the popping begins to slow, transfer the puffed quinoa to a bowl and repeat the process to puff the rest of the quinoa. To eat puffed quinoa as a popcorn-like snack: Season the freshly puffed quinoa while it's still warm by tossing it with a drizzle of olive oil and a sprinkle of sea salt. Create a more flavorful snack by tossing the tiny kernels with seasonings such as five-spice powder, curry powder, nutritional yeast, Parmesan cheese or garlic powder -- the options are only limited by your creativity and palate. To eat puffed quinoa cereal: Add the puffs to a bowl, sweeten it as desired with sugar, honey, agave or maple syrup, and pour milk over the top. Add fresh berries or sliced fruit for natural flavor and sweetness. Use puffed quinoa as a topping: Use puffed quinoa as a crunchy topping for your favorite yogurt, ice cream or salad. Make puffed quinoa balls, such as these inspired by the blog Vegangela, for a quick treat or snack. Start by combining 1 cup of puffed quinoa with 1/2 cup of nut butter, 3 tablespoons of honey or agave nectar, 1 tablespoon of crush nuts and 1 teaspoon of vanilla extract. Place the mixture in the refrigerator for 15 minutes, then roll it into small balls and refrigerate it for at least 15 minutes or until the balls feel firm before serving.